We all love taking the opportunity to relax and unwind at a spa, but how often do we really treat ourselves? With Spafinder vouchers you can enjoy amazing savings on spas, wellness centres, health and beauty treatments and more all around the country – so there's no excuse not to get pampered. Whether it's a day out with the girls or a whole weekend of dedicated 'me time', a Spafinder voucher will help you save the pennies. The spa industry in the UK is booming, and as such it can be difficult to navigate and find the treatments that are right for you. Thankfully, that's where Spafinder comes in. With over 25 years' experience, they are the world's largest media, marketing and gifting company in the spa and wellness industry. At Spafinder, they know a thing or two about spas. Through the Spafinder Wellness 365 brand, they operate a global network of widely distributed gift cards – available at over 70,000 retailers worldwide – that allow people to buy a spa and wellness treat for someone they love for a special occasion or just to show that they care. Gift cards can be redeemed at more than 1,000 spas, salons, fitness, yoga and pilates studios in the UK – plus over 20,000 locations around the world – so wherever you are, you can find a place to indulge your mind, body and soul. Spafinder operates as an informative, independent hub for the spa and wellness industry both in the UK and internationally, allowing customers to choose reliable, quality spas to visit for a wide range of treatments. Looking for a comprehensive spa day package where you can really kick back and unwind? Spafinder provides a booking platform for a broad selection of treatments and experiences, offering everything from facials and manicures to bull body massage and more. Or perhaps you fancy spending a weekend away from the world enjoying delicious, healthy food and top-of-the-range facilities in award-winning wellness escapes around the world? Spafinder covers destinations throughout the UK as well as spas throughout Europe, Asia and the rest of the world. 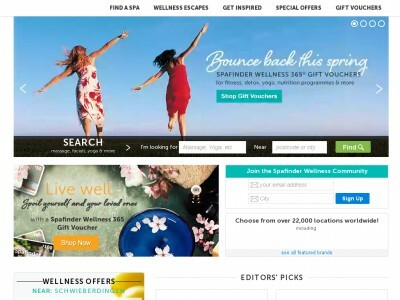 As well as an efficient booking service for local and global spas, Spafinder also operates a dedicated wellness blog packed full of ideas and inspiration, guides to enjoying your spa experience, special offers and more. Want to treat yourself with Spafinder? Spafinder vouchers are a great way to get amazing discounts on a wide range of spa-related products and services. From individual treatments and weekend breaks to acupuncture, alternative therapies, reflexology and more. A Spafinder voucher will help you treat yourself without breaking the bank. Individual treatments, wellness breaks, special offers and more. Browse our website until you find the Spafinder vouchers that suit you, then navigate to their website to begin shopping. Enter your requirements and click 'Find'. To purchase a gift voucher, click 'Buy gift voucher'. Enter your details and click 'Checkout'. Enter your Spafinder voucher in the box provided and click 'Apply'. Want to discover more about wellness with Spafinder? Why not pay a visit to their dedicated YouTube channel? You'll find lots of exclusive content including recipe ideas, fitness tips, spa guides and more. You can also use this channel to find out more about saving money with Spafinder vouchers? If you've enjoyed shopping with Spafinder, you might also like to check out more great deals on health and wellness products at stores like Lloyds Pharmacy or AllBeauty. Or, if those aren't right for you, you'll find plenty more deals to browse in our Beauty and Health section. Enter your Spafinder vouchers in the box provided and click 'Apply'. Enter your payment details and click 'Submit order' to complete your purchase. Spafinder vouchers are available either as email or postal vouchers, both free of charge. Need to speak to the team at Spafinder? Whether you have a question about your purchase, want some expert advice on choosing the right spa or simply want to find out more about how you could make big savings with a Spafinder voucher, you can contact the Customer Services department by accessing the online contact centre here. Want to discover more from Spafinder? Why not follow them across your favourite social media networks? You'll enjoy access to lots of interesting content including industry news and awards, special offers, competitions and more. You can also use these pages to find out more about saving money with Spafinder vouchers. Don’t forget to check them regularly, as you can never be sure when free Spafinder vouchers might be waiting for you! Buy now online at www.spafinder.co.uk. I wanted to treat my sister to a spa break for her birthday, but I wasn't sure which one to choose. Then I discovered a Spafinder voucher online. With Spafinder vouchers you can get great deals on an amazing range of treatments at spas and wellness centres around the country via spafinder.co.uk. I used my Spafinder voucher to get a great deal on a gift card for a wellness break at a choice of UK spas, so she could pick what she wanted to do. So why not treat someone you love for less?